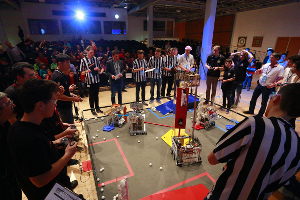 In March, 16 international teams met at the Heinz Nixdorf Museums Forum to compete in the FIRST Tech Challenge 2015. Organized by the wonderful people of Hands on Technology e.V., I had the pleasure of being part of this great event as this year’s moderator. More than 3.000 teams participate yearly in this international program. Teenagers and young adults at the age of 14-20 form teams to build and program a robot to compete in different categories in this innovate and creative challenge.